Let just be frank, Exeggutor is one of the weirdest Pokemon. First how to say Exeggutor. I think you say EX-Egg-Utor. That has to be one of the funniest but weirdest names in Pokemon. He also looks weird. Weird as heck. Kind of like a walking three headed tree dinosaur. He kind of looks like he escaped out of Fragglerock. To add to this weirdness is the fact that he is a dual type Pokemon. To be exact a GRASS / PSYCHIC Pokemon. That is a also a weird to think about. He is basically a Psychic Plant. 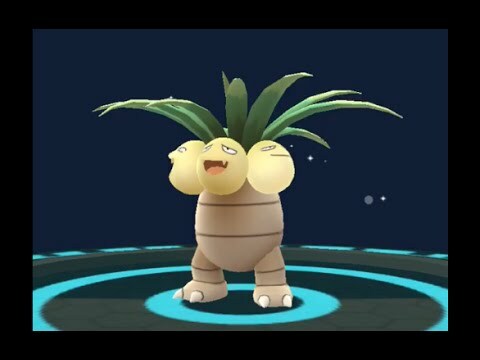 Exeggutor is the evolved form of Exeggcute. I have had no luck finding either Pokemon however my understanding is that Exeggcutes are fairly common in some places. This has led to Exeggutors to start showing up in gyms. One of the ways I see that that Exeggutors are doing well is that WATER Pokemon and in particular Vaporeon are very common in gyms. In many cases many Pokemon trainers best Pokemon is a Vaporeon well GRASS attacks work very well against Water Pokemon and in this way Exeggutor can climb the rungs at many a gym. As far as battling goes this is the first thing to note he is Vaporeon killer do not use Vaporeon against him. He will make you pay. You might ask how the dual type effects Exeggutor. As far as I can tell he inherits the trait of both Psychic and GRASS Pokemon in full. So he basically has a big group he does very well against and a big group he does poorly against. HOW TO FIGHT and BEAT an Exeggutor? What is best Pokemon to use vs Exeggutor? Alright this multi headed monster has been on top of that gym enough. Lets saw this psychic tree down. TIMBER!!!!!!!! Lets get Strategic. As said above Exeggutor is both GRASS and PSYCHICthis means attacks from these types will do well against him BUG, DARK, GHOST, FIRE, ICE, POISON, and FLYING. Mean while damage from PSYCHIC, Electric, GRASS, GROUND, WATER and Fighting will do far less damage. Gengar is a great offensive option but note that he has a major weakness defensively to Exeggecutor's psychic move set. The big mistake I see people making against Exeggutor is using Vaporeon against it. Don't do that, pick a FIRE pokemon instead and you should be fine. BUG Pokemon like Pinsir, Parasect, Scyther work well against Exeggutor. I have begun having great success against Exeggutor by using bug Pokemon particular Parasect and Scyther. If you use either you want to make that both of their moves are Bug. I really recommend using them or another bug Pokemon against him. DARK Pokemon are also a good choice. Depending on its the Exeggutor's attacks this could actually be the best choice. Read on below on Defensive considerations. One thing that makes Exeggutor difficult from a defensive standpoint is that if it can have a variety of attacks that could vary between PSYCHIC and GRASS this means that its PSYCHIC attacks will still do normal damage to you if picked a FIRE /FLYING Pokemon. However if it has GRASS attacks your FIRE/FLYING Pokemon will receive only half damage. Only one type of Pokemon receives half damage from PSYCHIC and GRASS attacks and that is Steel. This makes Steel pokemon a solid defensive choice, however Steel Pokemon are very rare. If the Exeggutor uses PSYCHIC attacks then the overall best pokemon type is definitely a DARK these Pokemon have powerful (Potentially total) immunity to PSYCHIC attacks and also get a x2 attack bonus. However, Dark Pokemon ARE RARE!!! I have had zero luck catching any of them. I think the most common would be a Houndour but I have not seen one of them. Overall while Steel and DARK certainly have their merits I see most people using a FLYING or FIRE pokemon. While not perhaps the overall best type they do hold a powerful advantage over Exeggutor.